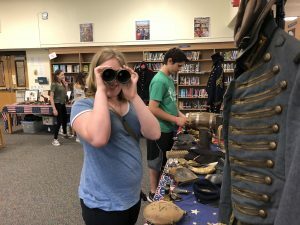 This morning, the South Orangetown Middle School Library was transformed into the Civil War Living Museum for seventh-grade social studies classes. Students listened to an engaging, interactive lecture about Civil War history and had an opportunity to explore authentic artifacts. “We’re starting to learn about the Civil War, so this is an introduction,” said Luke H.